Continuing with the admixture analysis with our new reference 3 dataset. Here's the results spreadsheet for K=11. Now let's take all the reference populations with an Onge component between 10% to 50% and use the equation above to calculate their ASI percentage. The results are in a spreadsheet. There are several populations with an even higher Ancestral South Indian than any of the Reich et al groups, with Paniya being the highest at 67.4%. 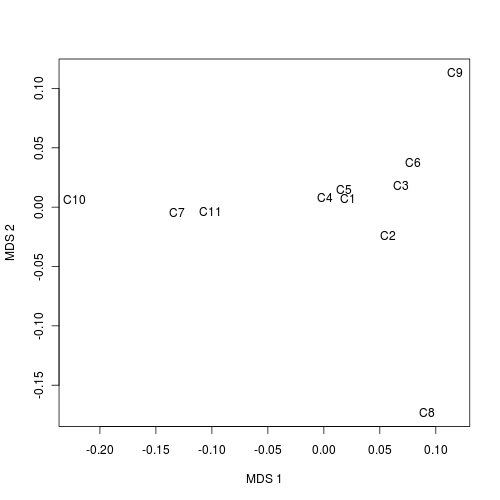 Fst divergences between estimated populations for K=11 in the form of an MDS plot. 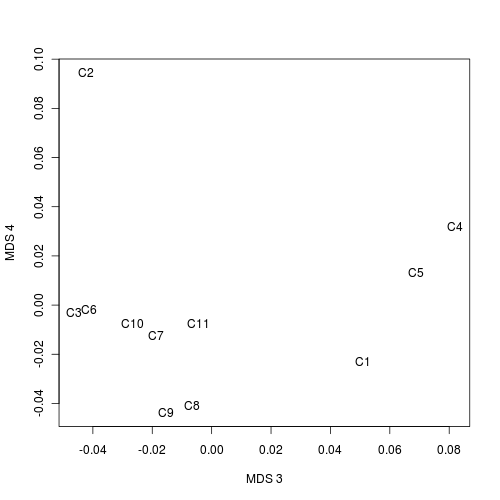 I guess you might want to see the Fst dendrogram too. Just remember it's not a phylogeny. The Kalash appear to have 0 Ongee. I think this is a very interesting result. The Kalash are a small isolated non-Islamic group in Pakistan. I suspect that ASI percentage in Pakistan as a whole was much lower before the coming of Islam. After the coming of Islam, women from the rest of the subcontinent must have contributed significantly to the genetic heritage of present-day Pakistanis. Many Pakistanis even have some African ancestry brought about by Islamic connections. These are only a minority of Sindhis. Punjabis and Pashtuns almost never have African admixture. Some ASI admix should have always been in Pakistan, albeit far less so than in India. Pakistanis are generally more West Eurasian than generic Indians. The african in the sindhi sample is due to certain individuals who are siddi in the sindhi reference sample. The African ancestry of certain of the Pakistani Reference 3 groups is as follows: Balochi 3%, Brahui 3%, Makrani 7% and Sindhi 3%. This ancestry if from Africans transported by sea to Pakistani ports in the South. It would have been much easier to transport people from India to Pakistan by camel caravans across the Thar desert leading to increase in the ASI percentage in Pakistan. This largely female-mediated gene flow from India to Pakistan during the several centuries of Muslim rule over the subcontinent could very well account for much of the 20 to 25% ASI found in Pakistan today. That may the case. It is possible that ASI is comparatively recent that it has not reached the Kalash due to their isolation. Plus the Kalash are off the Indian Cline too as are many of the populations with high Onge (Onge, Great Andamanese, Kharia, Santhal, Sahariya, Hallaki are not on Reich's Indian Cline). In eastern India, IE speakers are close to 100% R (R1a1+R2) on their Y-dna while their close non-IE speaking neighbors are 0% R - the Bhumij, Birhor, Ho, Kharia, Munda, and Santhal (Austro Asiatic) collectively show 0/56 R1a1 and 0/56 R2 (Sahoo data). The Austrics are predominantly O2a which in turn is 0% among IE speakers. Almost no overlap on Y. There is some overlap on mtDNA but not much. Which means one of these populations is very recent. Regarding the Indus people, there is some stats on how they compare to modern people. Cranial they were diverse but fit within South Asian variation and they cluster more with the Vedda of Sri Lanka more than anyone else. For this reason I think they were mixed ANI/ASI rather than one or the other. Would it be safe to say that Onge component represents a layer of early negritos in South Asia. Ganga Plains measured 5 inches taller than modern South Asians and what happened to the Onge was probably the result of a size reduction. Thanks. The mean calculated height of the Nahar Rai females is 6'2.8" ! sites with short stature, to Eastern groups with intermediate stature (Formicolaand Giannecchini 1999). Figure 3 shows that individuals from both Damdama and Mahadaha are significantly taller than Mesolithic Europeans." 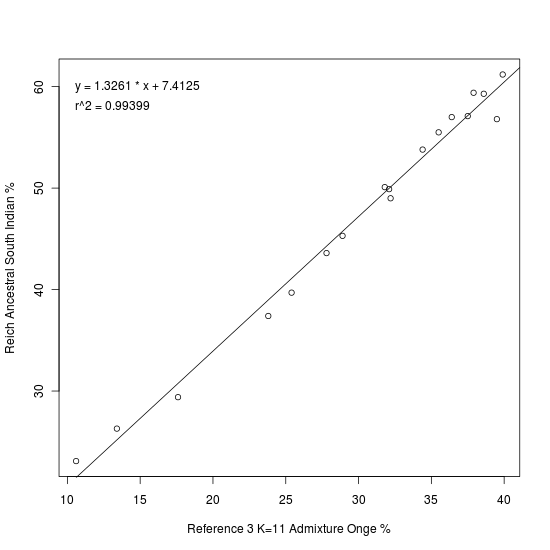 Tight enough correlation to assert this component is comparable with the ASI. Whether or not Reich's ASI was the best representative for a part of India's prehistoric demographic is another question. Nevertheless, it's exciting to see this. I wonder whether we'll soon see a component that's specific to the ANI? For South Asian groups in this analysis here (excluding the Brahui, Balochi and Makrani), if you add up South Asian (C1), Southwest Asian (C4) and European (C5) that approximates ANI, though not as well as Onge (C2) does for ASI. Looks more like eastern/south eastern. 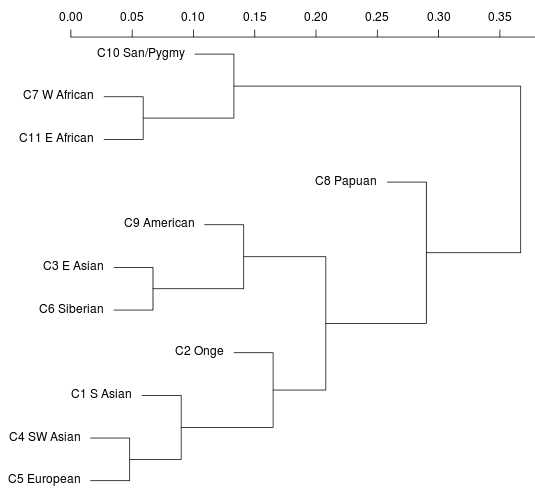 Very puzzling that many of the populations in which C2 peaks are Austric - Santhal, Ho, Kharia, Bonda, Savara, Juang, Asur. Cf. Reich: "Santhal ... have a relatively high proportion of ancestry from ASI compared with most of the Indian Cline groups." well the brahui are not aryan their tongue is dravidian but they are mostly likely from the elamites who were a afro asiatic people the brahui have 28% J ydna ! Elamo-Harappan origins for Haplogroup J2 in India? The presence of Haplogroup J2 in India, including the subclades M410 and M241 has been an often overlooked clue to the origins of M172. Sengupta et al, in 2005 worked to explain the presence of M172 in India. Their paper provides an immediate acknowledgement of the proposed spread of proto-Elamo-Dravidian speaking peoples into India originating from the Indus Valley and southwest Persia. The idea that M172 may have been carried into India with proto-Elamo-Dravidian groups is supported by the frequencies of Haplogroup J in one of the only remaining Dravidian Speaking ethnic groups in the Iranian Plateau, the Brahui. 28% of the Brahui, an ethnic Dravidian speaking group from Western Pakistan were found to carry the mutation defining Haplogroup J. Overall Haplogroup J2 in India represented 9.1% of this very populous nation. In Pakistan, M172 accounted for 11.9% of the Y-Chromosomes typed. Sengupta's paper broke down the frequencies of Haplogroup J2 into various caste and language groups. J2 was found to be significantly higher among Dravidian castes at 19% than among Indo-European castes at 11%. J2a-M410 in particular may be a strong candidate for a proposed migration of proto-Dravidian peoples from the Iranian Plateau or the Indus Valley since J2a M410 is a very high component of the haplogroup J2 chromosomes found in Pakistan. Over 71% of the M172 found in Pakistan was M410+. Another interesting characteristic in the distribution of M172 and more specifically, M410, in India was its higher frequencies in Upper Caste Dravidians. M410+ chromosomes were found in 13% of Upper Caste Dravidians. Sengupta goes on to suggest an Indian origin of Dravidian speakers but from a Y chromosome perspective, the paper seems to acknowledge M172 arriving in India from Middle Eastern and Indus Valley Civilizations. info below is from wikipedia! Mari (modern Tell Hariri, Syria) was an ancient( Sumerian and Amorite city), located 11 kilometers north-west of the modern town of Abu Kamal on the western bank of Euphrates river, some 120 km southeast of Deir ez-Zor, Syria. It is thought to have been inhabited since the 5th millennium BC, although it flourished with series of superimposed palaces that spans a thousand years, from 2900 BC until 1759 BC, when it was sacked by Hammurabi. Abu Kamal (Arabic: Ø£Ø¨Ùˆ ÙƒÙ…Ø§Ù„â€Ž, Turkish: Ebu Kemal or KÄ±ÅŸla) is a city in eastern Syria on the Euphrates River near the border with Iraq. The Euphrates divides Abu Kamal into two areas: Shamiyya (belonging to the Levant) and Jazira (belonging to Mesopotamia) Al-Jazira, a plains region consisting of northeastern Syria and northwestern Iraq, quite distinct from the Syrian Desert and lower-lying central Mesopotamia. Abu Kamal is an economically prosperous farming region with cattle-breeding, cereals, and cotton crops. It is also home to the historical site Dura-Europos and the ancient kingdom of Mari. i have also dreamt 2 times the sumerians are the dravidians and 1 time they are from canaan and i dreamt the elamite are afro asiatic not caucasian!neither aryan! This is clearly blatant trolling/spamming, as are the other comments.